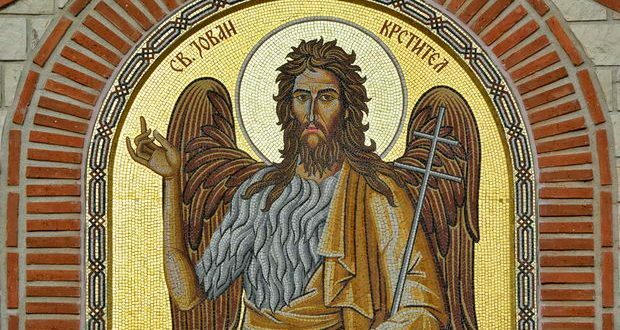 Christian church has devoted several holidays to St. John the Baptist (Sveti Jovan Krstitel) and it's not accidental. This holiday is symmetrical with Christmas Day, the day associated with winter solstice. Among the major summer holidays that are celebrated with many customs and beliefs, is the holiday known as Midsummer or Ivanden, which is actually a holiday dedicated to the birth of John the Baptist. St. John was called the Baptist because he baptized Jesus, named also as Pretecha, meaning predecessor. With his teaching, he preceded Jesus and went before him and heralded his arrival. Council of St. John the Baptist, and so on. In folk life and according to folk beliefs, St. John is significant for he has the godfather and brotherhood. MIDSUMMER (Ivanden) is one of the most important holidays in the Slavic world in which intertwine many customs and beliefs of the old Slavic mythology, with the celebration of the birth of St. John the Baptist. According to sacred tradition St. John and Jesus Christ were close relatives because John's mother, Elizabeth, was cousin (according to others even a sister) to Anna, mother of Mary, or Aunt to Mary, the mother of Jesus. At that time, according to an old prophets, Jews were under Romans slavery. At that time there lived an honest and pious priest Zacharias and his wife Elizabeth. They were already grown old, and had no children which was a big accident at that time and God's punishment for a great sin. Both consistently and sincerely prayed to the Lord to give them a child, and God heard their prayers. Once when Zechariah, prayed in the temple to God, he heard the voice of the angel Gabriel who told him he would have a son who will be called John (Jovan). Because he didn't believed in what he heard and saw, he immediately lost his speech as a punishment. When his son was born, according to the custom he should've been named after his father, but when Zacharias was asked about the name, because he had lost his speech, he took a plank and wrote: "May he be called John." When he wrote that, his speech was returned and he told that the child would be a prophet that will go in front of the Savior and prepare His way. In his youth, John loved life in the desert. He lived in a desert in the lower reaches of the river Jordan, dressed in fabrics made of camel hair and ate locusts and wild honey bees and roots of herbs. At the age of 30 years, he left the desert by God's will and returned between the Jewish people, where he taught people to repent and prepare for the coming of the Savior. John openly spoke out against all injustices, defects and disadvantages in humans. He invited sinners to repent so they could go to the kingdom of heaven. MIDSUMMER is associated with many customs and beliefs but mostly concerning herbs and belief in their magical powers. The eve of the feast is berried fern, which in turn is related to the belief in his magical power. Ferns are placed on the bed and sleep on for health. Eve before the feast, women pick flowers called Ivanden, which they put in closets with clothes to keep moths away.